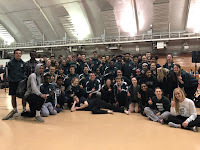 The Madison Memorial girls JV track & field athletes traveled to Beloit HS Thursday night to take their turn at conference dominance and the final Big 8 event of the season. Our girls team has smaller numbers than we would like but the girls who were available to compete at the JV meet represented very well. Although we are not as deep as many of the other JV teams, the girls scored 39 points for 6th place in the meet. This brought a close to a nice season for our JV athletes. The girls team were led by 2nd place finishes in the 4x800m relay (11:45) and 1600m run by Kyra H in 5:56. Other girls scoring with their top 8 finish include: 3rd place by Sarah H in 200m dash (28.5), 4th place by Allison H in long jump (13' 9"), 6th by Carlie L in the 100m hurdles (19.5), 7th place by Flo L in the 400m run (1:10.7), & Lindsey O in long jump (13' 3"), and 8th place by Molly E in the 400m dash (1:10.8). Some other great performances include PRs by Deja H in the 100m hurdles (21.2), Shalini P in the 100m dash (15.2), Gretchen H in the 1600m run (6:59), Kiarra G in the 200m dash (30.8), & Dani F in the 200m dash (31.1).